Pelosi made the remark as part of her criticism of the Republican tax-reform plan. Under the last three House speakers—the Democrat Pelosi and the Republicans John Boehner and Paul Ryan—the federal debt has more than doubled, increasing by an average of more than $1 trillion per year. That is an increase of 136 percent in a little less than eleven years. 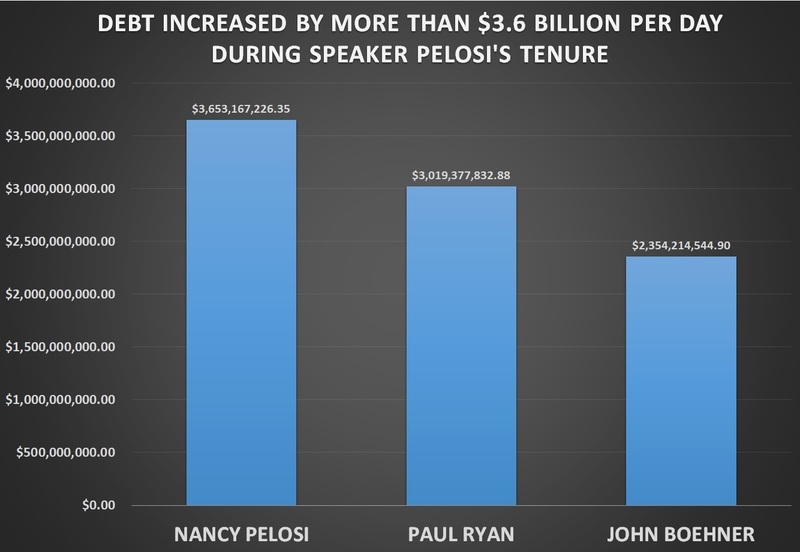 During the 3,996 days in the combined speakerships of Pelosi, Boehner and Ryan (so far), the debt has increased at an average of $2,958,630,883.86 per day—or almost $3 billion per day. In that time, it increased fastest under Pelosi’s speakership, second fastest (so far) under Ryan, and third fastest under Boehner. In the 1,462 days that Pelosi served as speaker--Jan. 4, 2007 to Jan. 5, 2011--the debt jumped from $8,670,596,242,973.04 to $14,011,526,727,895.85. That was an increase of $5,340,930,484,922.81 in four years. That means that during Pelosi’s speakership, the debt increased at an annual average of more than $1.3 trillion ($1,335,232,621,230.70) and a daily average of more than $3.6 billion ($3,653,167,226.35). In the 1,759 days that Boehner served as speaker—Jan. 5, 2011 to Oct. 29, 2015—the debt jumped from $14,011,526,727,895.85 to $18,152,590,112,385.69. That was an increase of $4,141,063,384,489.84 in the approximately 4.8 years Boehner served as speaker. That means that during Boehner’s speakership, the debt increased at annual average of approximately $862.7 billion ($862,721,548,435) and a daily average of more than $2.3 billion ($2,354,214,544.90). In the 775 days Ryan has served as speaker for which the debt has been reported—Oct. 29, 2015 through Dec. 12, 2017—the debt jumped from $18,152,590,112,385.69 to $20,492,607,932,866.63. That was an increase of $2,340,017,820,480.94 in the approximately 2.1 years Ryan has served as speaker.